Michael Keaton’s floating ghost head is scary. When a young couple stretch their finances to breaking point to buy a large fixer upper in a prime area, they figure that they can make ends meet by renting out a couple rooms. After the ‘let’s work together to fix this’ montage, Pattie (Melanie Griffith) and Drake (Matt Modine) stand side by side, wipe the sweat from their brow and throw a For Rent sign out front. Within days they see many applicants, some desirable, some not so much. With an elderly Japanese couple moving into the first unit, the decision is who will take the second. Then Carter Hayes (Michael Keaton) sweeps in with his expensive car, smooth suit and roll of cash. While this first half hour is deliberate and slow, you will soon come to yearn for such times, as the overblown second hour spirals out of control. Of course Hayes isn’t everything he seems. Once entrenched in the room things start getting all kinds of mysterious and creepy. Peepholes, misunderstandings, bounced cheques, confrontations and arguments, and random insect infestations. With no money coming in and disgruntled paying tenants leaving thanks to the hubbub, Drake’s stress levels grow, and its fair to say that he overreacts to buggery on many occasions, normally to his detriment. 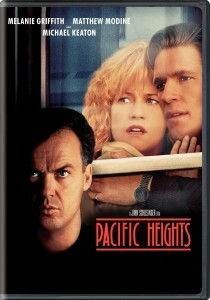 Funnily enough amidst all the silliness, it is Keaton as Hayes that plays it low key, almost to the point of boredom. If it weren’t for the frightfully ridiculous last 15 minutes, you could be forgiven for thinking that he was sleepwalking through until cheque time. Pacific Heights is another film to be remade every decade or so with a different name, the unwelcome guest with menacing intent and dangerous possibilities. This is a particularly unlikely version of events, and will leave you wondering just how worthwhile it is for a supposedly petty criminal to risk death multiple times in order to make a little dough.